Board Certified Orthopedic Surgeon and an arthroscopy and sports medicine expert. In treatment of athletic injuries and complex disorders and fractures of the extremities including shoulder and knee ligament repair and reconstructive surgery. Dr Khan is the founder of the Texas Institute of Orthopedic Surgery and Sports Medicine (TiOS). He is a Board Certified Orthopedic Surgeon and an arthroscopy and sports medicine expert. He is double fellowship trained in Sports Medicine & Arthroscopic surgery as well as Foot and Ankle Surgery. He specializes in treatment of athletic injuries and complex disorders and fractures of the extremities including shoulder and knee ligament repair and reconstructive surgery. 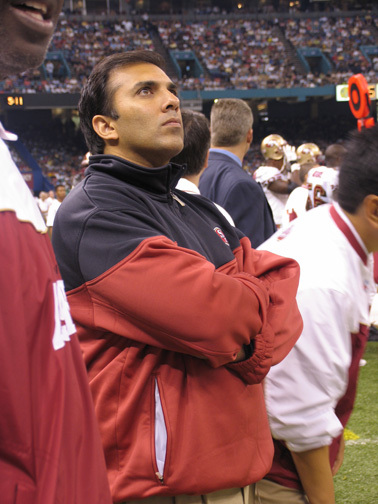 Dr Khan has vast experience in the care of the high level athlete at both the professional and amateur level including: NFL Football-San Francisco 49er’s (1999- 2006), XFL Football-San Francisco Demons, The X-games at San Francisco, San Jose Ballet, Stanford University and Santa Clara University athletics and several NCAA Division-I tournaments including Basketball, Soccer, and Volleyball. Dr. Khan is an avid athlete, and his love for sports continues to be the driving force in supporting all his patients to achieve and/or exceed their goals. Dr Khan attended medical school at Tufts University in Boston, Orthopedic residency at the Teaching Hospitals of the State University of New York (SUNY) at Stonybrook, NY, and both fellowships at SOAR/Stanford University, CA. He has received numerous educational awards and distinctions and has authored several publications in reputed orthopedic journals. He remains active in orthopedic research. He is a Fellow of the American Academy of Orthopedic Surgeons, member of the Arthroscopy Association of North America and Texas society of sports medicine.